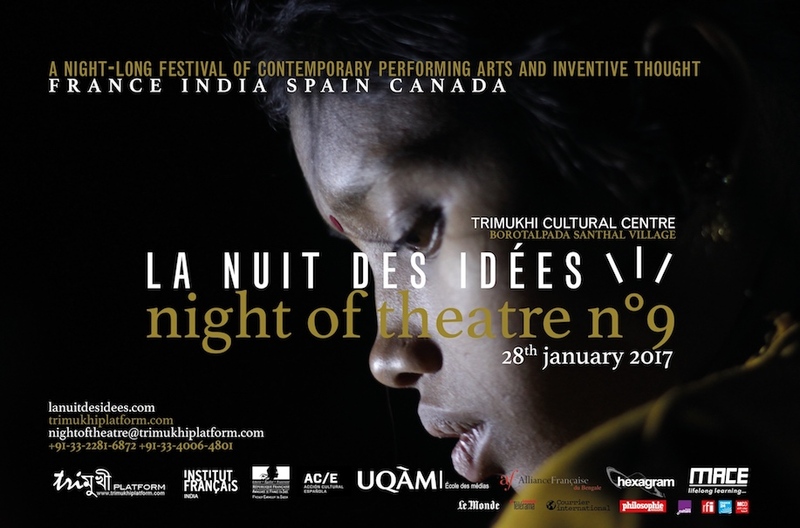 La Noche de teatro n°9 / La Nuit des idées tendrá lugar en la comunidad indígena santalí de Borotalpada, India, el 28 de enero 2017. Intervendrán artistas y filósofos de Francia, Canada, España e India. El programa, presentado por Trimukhi Platform y Institut Français en India, en colaboración con la Embajada de Francia en India, Alliance Française du Bengale, Ecole des Médias de l’Université du Québec à Montréal (UQAM), Acción Cultural Española AC/E, MACE y Hexagram . Alternaran espectáculos de teatro-danza, instalaciones sonoras, deambulaciones nocturnas con mesas redondas donde especialistas analizarán la relación entre artes y pensamiento. El viaje desde la ciudad de Calcutta inicia el sábado a la 1 de la tarde, regresando al dia siguiente a las 10 de la mañana. Las reservaciones están abiertas en la Alianza Francesa del Bengala, en MACE y en linea (nightoftheatre@trimukhiplatform.com) del 1ero al 23 de diciembre 2016. 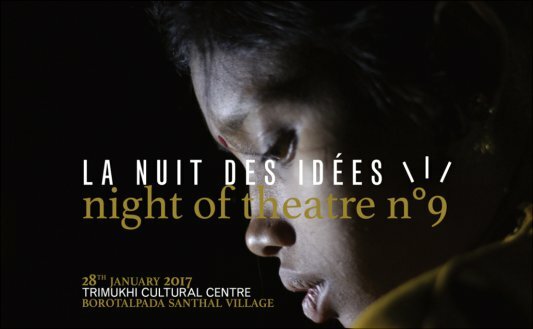 Proposée par Trimukhi Platform et l'Institut Français en Inde, la Nuit du Théâtre n°9 / La Nuit des idées aura lieu le 28 janvier 2017 dans le village santhal de Borotalpada. Au programme, outre des spectacles de danse-théâtre, des installations in situ et autres déambulations nocturnes, il y aura aussi des tables rondes où des spécialistes discuteront de la relation entre les arts et la pensée. Les artistes et philosophes participants sont originaires du village ainsi que de Calcutta, Paris, Madrid, Berlin et Montréal. Comme de coutume, après le dîner, aux alentours de minuit, une dance-party multiculturelle sera organisée. Les réservations sont ouvertes du 1er au 23 décembre 2016 à l'Alliance Française du Bengale, à MACE et en ligne. 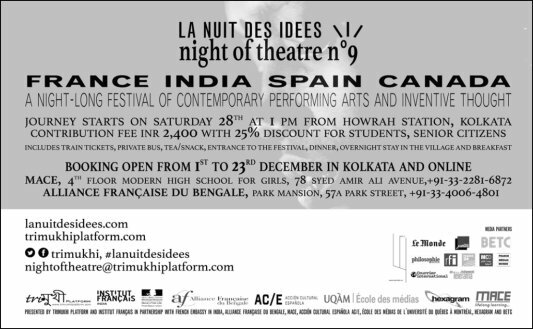 The Night of Theatre n°9 / La nuit des idées is a night-long festival of contemporary performing arts and inventive thought, to take place on Saturday 28th January 2017 at Trimukhi Cultural Centre in the Santhal tribal village of Borotalpada, West Bengal, India. During the night-long event, artists and thinkers from Kolkata, Paris, Madrid and Montréal, together with Santhal actors, dancers and musicians will both showcase in situ performances and evolve in stimulative conversations about art and thought. The night-long program ends with a multicultural dance party. [ENGLISH] Reporting for The Telegraph on the 2014 edition of the Night of Theatre, journalist Mohua Das wrote: "There was something magical about making one’s way through the backwoods and settling down under the open skies, feeling the caress of a wintry breeze and watching performances in the dark — imaginative and untamed. Our sense of disorientation was pushed to the limit: the stage was amazingly innovative and there was a constant effort to tickle the senses." [FRANÇAIS] Rendant compte pour The Telegraph de l'édition 2014 de la Nuit du Théâtre, la journaliste Mohua Das écrivait: "S’asseoir à même le sol sous un ciel immense, être caressé par une brise fraîche en attendant que le spectacle s’ouvre sur la nuit noire, cela avait déjà quelque chose de féerique. Ce théâtre imaginatif et sauvage nous déroutait, nous bouleversait, nous poussait hors de nos propres limites. Avec seulement quelques lumières, trois ou quatre effets techniques, un paysage rural nocturne était transformé en une scène innovante tout occupée à mettre nos sens à vif. " [ENGLISH] Reporting for The Time of India, journalist Rakhi Chakrabarty wrote: "Across the Subarnarekha, where the road ends and rolling fields spread out against the sky, is a sleepy Santhal village called Borotalpada. On Saturday, the remote Adivasi village in West Midnapore district was buzzing with activity. For, it was a Night of Theatre. A theatre with home-grown actors. A theatre of the soil. A contemporary theatre, directed by Jean-Frédéric Chevallier, a French professor (of theatre and philosophy) who has made Kolkata his home since 2008. Chevallier’s is a theatre of the present, where life will be presented, not represented; theatre where life unfolds as life as we experience it." [FRANÇAIS] Dans The Time of India, la journaliste Rakhi Chakrabarty rendait compte de son expérience de 2015 : "Au-delà de la rivière Subarnarekha, lorsque la route bitumée termine pour laisser place à des champs ondulés à perte de vue, se trouve un village Santhal endormi appelé Borotalpada. Samedi, ce village tribal retiré bouillonnait d'activité. Car c'était une Nuit de théâtre. Un théâtre avec des acteurs du lieu. Un théâtre de la terre. Un théâtre contemporain sous la direction de Jean-Frédéric Chevallier, philosophe et metteur en scène français, qui a fait de Calcutta sa maison depuis 2008. Son théâtre est un théâtre du présent, un théâtre où la vie est présentée et non représentée, un théâtre où la vie se déploie telle la vie dont nous faisons l'expérience." [ENGLISH] Reporting for Kaahon.com, journalist Meghna Nandi observed: "Jean-Frédéric Chevallier emphasizes upon the significance of contemporary art and theatre. He describes the performances he directed as a counterpoint to the more traditional notions; stripped off the need to build up a sense of drama on stage. He articulates them as a binary of re-presentation in the past and simply presentation in the contemporary times. In fact, underlining the importance of the present lived experience of the performances; he even theoretically calls them: "Theatre of Presenting"." [FRANÇAIS] Rendant compte pour Kaahon.com, de l'édition 2015 de la Nuit du Théâtre, la journaliste Meghna Nandi écrivait : "Jean-Frédéric Chevallier insiste sur le sens de l'adjectif "contemporain" et du substantif "théâtre". Il décrit les spectacles qu'il a mis en scène comme autant de contre-points face à des notions plus traditionnelles ; il évacue la nécessité du drame sur le plateau. Il articule sa réflexion autour du binôme re-présentation (dans le passé) et simple présentation (à l'époque contemporaine). De fait, pour souligner l'importance de l'expérience vécue au présent, il en vient à parler d'un "Théâtre du présenter"." 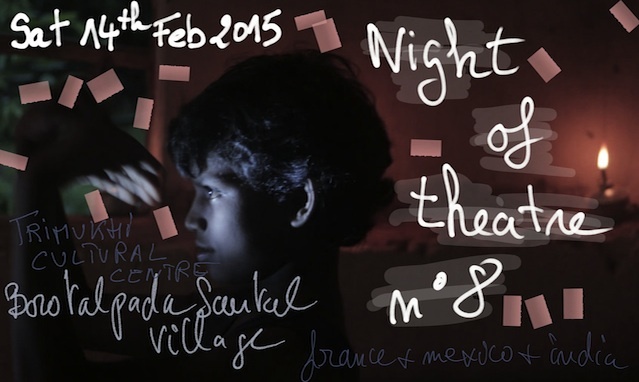 The Night of Theatre n°8 was held on 14th Feb 2015 at Trimukhi Cultural Centre in the Santhal tribal village of Borotalpada (West Midnapore, West Bengal, India). During the night-long event, artists from La Habana, Paris, Kolkata and Mexico city, together with tribal actors, dancers and musicians showcased in different places around and inside Trimukhi Cultural Centre, theatre, music and dance performances as well as a double sound installation and happenings. For this 8th edition, a reduced number of guests audience from Kolkata was received so to favor exchange and dialogue with the villagers. The program ended with a multicultural dance party. The bus returned at 5:45 AM. The 7th edition of the Night of Theatre took place on 15th February 2014 at Trimukhi Cultural Centre. Artists from Paris, Bogotá, Kolkata, Mexico city and Borotalpada village presented outside the Centre theatre, dance and music performances as well as an experimental film. Two of these stage works were the result of a 12 day rehearsals process together with 15 villagers. Journalist Mohua Das reported the event for The Telegraph: “There was something magical about making one’s way through the backwoods with torchlights and settling down on the ground under the open skies, feeling the caress of a wintry breeze and watching performances in the dark — imaginative and untamed." The Sixth Night of Theatre was held in West Bengal, India, on 9th February 2013, at the Cultural Centre that Trimukhi Platform has been building in the Santhal village of Borotalpada. It involved theatre, dance, music, installation, photo exhibition and a video projection. Artists from India, Europe and Latin America were rehearsing together with painters, photographers, dancers, musicians and actors from the tribal area to prepare the 12 works to be shared in situ during the night-long festival. As a first activity in the Cultural Centre in construction, Trimukhi Platform in collaboration with Proyecto 3 (Mexico), MACE (India), CONACULTA (Mexico) and Teatro Ojo (Mexico) organized on 25th February 2012 in the compound of the building in process the Fifth Night of Theatre: a night-long program with stage works performed by groups composed with artists from different social worlds and geographic continents. It was a way to show that it is possible to bring up a project of high quality art creation among those who normally cannot access as spectators and as makers such a kind of professional platform. Produced by the National Mexican Fund for Art and Culture and the National University of Mexico, organized by Proyecto 3, with the collaboration of Trimukhi Platform the Fourth Night of Theatre took place on 5th September 2009 in Teatro UNAM, Mexico City, from 7 pm to 7 am. It was the première of 4 theatre performances directed by Rubén Ortiz (Mexico), Jean-Frédéric Chevallier and Matthieu Mével (France, Italy, India), Víctor Viviescas (Colombia) and Joseph Danan (France). Between each theatre play, a musical performance was proposed by Rogelio Sosa (Mexico).